Just clarify this, Gananoque Secondary School music students are coming to LaSalle for a jam session on Tuesday May 14th and NOT tomorrow. I mentioned last week that they will visit on a Tuesday but not tomorrow. It’s always been the 14th of May. I’ll post it again on the blog in another week as a reminder. Another exciting BrassWerks concert coming up! Featured soloists: Larry House, trumpet; Cory van Allen, French horn; Dave Barton, flugelhorn; Sylvain Gagnon, tuba. Send me something and I’ll post it on the blog. It should have said 930am for the practice on Tuesday not 930pm. Thanks to those who informed of it. We are having a LaSalle symphony rehearsal on Tuesday April 23rd at 930pm. We plan on running through, Nimrod, Pictures At An Exhibition, Doug’s arrangements of Anasazi, Bartok Folksong and Dance, Buglers and his new arrangement of O Canada. 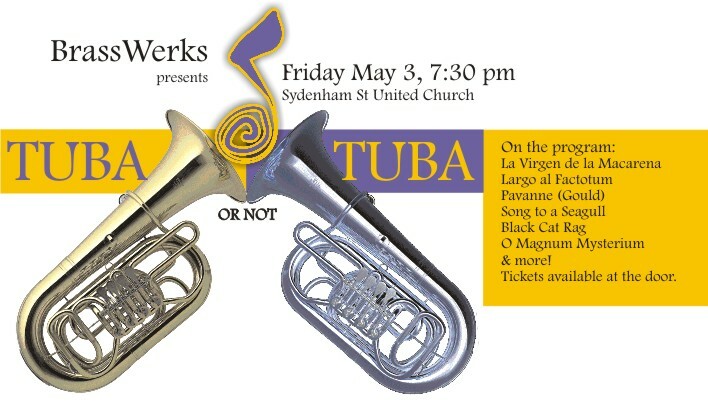 Should be lots of fun and it will be a rehearsal for our concert on May 26th. Hope you all can attend. If so, put a music stand in your car so we have enough for everyone. Thought you’d like to know that we found out last night that both Katie’s bassoon student Aviner Hartwick and my clarinet student Clara Troje both won 500 dollar bursaries for their separate performance submissions to the Kingston Symphony Association Awards. They will be asked to attend a Symphony concert before the end of this season to accept their cash awards on stage. Just a heads up about the up coming gig at the library. This one looks like a good day of music, some new music as well as some standards.